Translation is an important focus of our laboratory and towards this end we have generated valuable preclinical models to study potentially novel treatments. Our laboratory is studying molecular regulators of normal breast development and cancer, with a particular interest in breast stem cells and the breast epithelial cell hierarchy. Through clonal cell-fate mapping studies using a stochastic multicolour cre-reporter combined with a novel 3D imaging strategy, we have recently provided evidence for the existence of bipotent MaSCs as well as distinct long-lived progenitor cells. 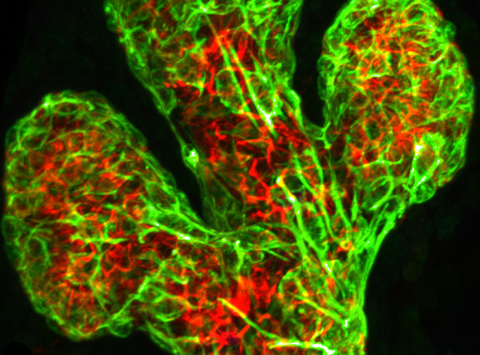 Current efforts are directed towards further understanding the normal epithelial hierarchy and the cell subtypes that are most susceptible to becoming transformed in vivo, the so- called ‘cells of origin’. We are searching for markers that enable further purification of stem cells to enhance our understanding of the heterogeneity that lies within this pool, using a combination of transplantation and cell lineage tracing studies. We are also identifying transcriptional and epigenetic regulators that act along the hierarchy using gene-targeted models and CRISPR/CAS9 technology. Promoter-specific strains built in the laboratory enable us to interrogate potential cells of origin of cancer. The laboratory’s extensive bank of human breast cancer xenografts that are serving as important preclinical models for testing new therapeutic drug combinations in the treatment of breast cancer. We are currently developing potential chemoprevention strategies that may eventually benefit women at high risk of developing breast cancer.